Bed bugs live fairly close to humans. All that they need to survive is blood. As a rule, a bed bug bites at night. 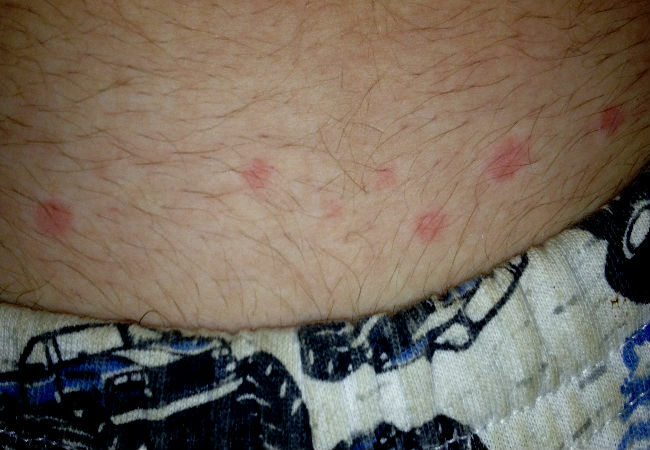 In fact, any bed bug bite is painless at first, but later it may turn into an itchy red swelling or welt. Moreover, bed bug bites can be confused with the stings of other insects (ants, mosquitoes, fleas). Mild bed bug bites are located on any area of skin exposed while sleeping. They do not have red spots in the center. In fact, any bed bug pierces the skin of its host about 3-7 times per one feeding. That’s why, you can see a chain of tiny red spots on your skin. If you press the mild bed bug bites, they will smell like cognac or brandy. Besides, you can notice some blood marks and spots on the bed-linen. The most annoying part of bed bug bites is that they can cause discomfort and pain. Fortunately, bed bugs are not vectors of viruses or parasites. In some cases, mild bed bug bites may end in skin bacterial infection due to scratching. Hence, the rule number one is NEVER SCRATCH any INSECT BITES! In some severe cases, a human may experience some type of allergic reactions. They come out in skin rashes or dermatitis, irritation, hives, panting and other symptoms that are life threatening. Seek for medical help in the case of severe allergy to bed bug bites immediately. To reduce the itchiness and redness of the welts, try applying some home remedies to avoid skin infection and provide quick relief. In fact, you may use a great deal of products that you have at hand. They help stop the welts from itching, reduce redness and promote healing. To begin with, wash the area affected by bed bug bites with warm boiled, soapy water. Then, rub this place with a cotton ball soaked in any antiseptic lotion. You can apply any product that you have at home. Any first aid antiseptic lotion, 3% vinegar, 3% hydrogen peroxide, 35% diluted rubbing alcohol, witch hazel, antiseptic wipes, calamine lotion, even solid deodorant and after-shave lotion are helpful. Use Russian vodka or just take one part of the 70% rubbing alcohol and dilute it with one part of distilled or boiled water. Antiseptic lotion to stop mild bed bug bites from itching and to prevent skin infection is ready! Simply soak a cotton ball with any antiseptic solution and apply directly on red bed bug welts. They will soon dry up and heal. The alkaline nature of solid deodorant and of after-shave lotion provides itch relief for bed bug bites. Rub some lotion or deodorant across the welts for quick effect. In addition, you may dilute 5% vinegar in water (1:1) and to relieve itching and to dry up the red bedbug bites and welts. Take apple cider vinegar or white vinegar and soak a cotton ball. Apply directly on the affected areas of mild bed bug bites. Be careful as it might irritate your skin if it is sensitive. Besides, lemon juice is a natural anesthetic and anti-inflammatory cure for bedbug bites as well. Apply cotton balls soaked in freshly squeezed lemon juice onto the welts to reduce the chance of developing a skin infection. You can use hot or cold temperatures to cure mild bed bug bites. These methods of treatment provide immediate itch relief and reduce redness in the bitten area. Apply ice cubes wrapped in a piece of cloth not to damage the skin. Place an ice pack or a hot-water bag on the area of bedbug welts. Leave for about 15 minutes. If ice or hot water bag are not available, hold the welts under a cool or warm running tap for a few minutes. Moreover, you can use a bottle of warm or cold water, a bag of frozen vegetables, a spoon dipped into hot water, and even warm tea bags. Be very careful not to hurt or damage the skin with cold and hot temperatures. If you have too many bites and they are too itchy, try to treat them taking a bath. 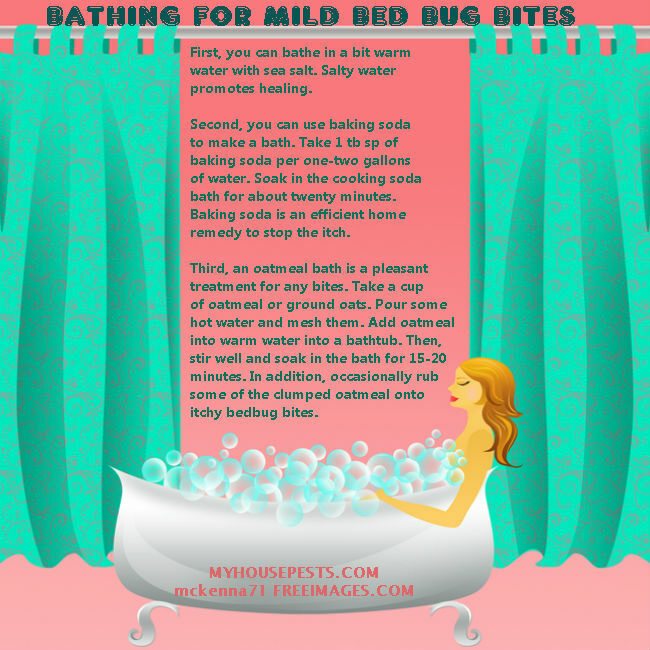 There are several ways to treat bedbug welts with bathing. Toothpaste, aloe vera gel, paste from crushed or minced basil leaves, paste from baking soda and water, galic and onion juice, paste from salt or meat tenderizer are the well-known applications for treatment of bed bug bites. Toothpaste contains fluoride that acts as an antihistamine remedy. Simply press some toothpaste onto a cotton disk and cover the affected areas to provide immediate itch relief for bed bug bites. Aloe vera is a natural antiseptic that widely-used for its healing properties. You can apply Aloe vera juice or gel to reduce pain and itch. Just cut of an aloe leaf (or branch), break it open, cover all the bedbug bites with plant juice. Then, rub directly onto the swellings and welts. Moreover, you can put the aloe vera leaf juice into the fridge and leave to chill for 20 minutes. Apply frozen aloe gel onto affected area. It will give you quick relief, reduce itching and redness. Crush some basil leaves. Then, add them to the freshly squeezed lemon juice and mix well. Place the paste on a cotton disk and cover the area of the bed bug bite with the application. Onion or garlic juices relieve itching of the welts and soothes the affected skin. Just mince onion or garlic and soak a cotton ball or a disk in the juice. Then, cover the red bedbug bites with the soaked balls or disks. Leave the application on for about 5 minutes. Then wash it off with warm water. Baking soda neutralizes the pH of the skin. Thus, it provides immediate itch relief for mild bed bug bites. Add 1 teaspoon of baking soda into a glass of water. Then, mix well and wait until properly diluted. At last, dip a cotton ball into the mixture and place it over the affected skin area for about 15 minutes. In addition, you can make a paste from witch hazel (or vinegar) and baking soda in equal proportions. Salt is known for its antiseptic properties that help reduce bed bug bite inflammation. Make a paste from some drops of cool boiled water and a small amount of table salt. Rub the salty paste over the mild bed bug bites. At first, it may cause a burning sensation for a few seconds. However, itch and pain relief will follow after. Peel a potato and puree it in a blender. Then, place the potato paste on the bed bug wheals. If bedbug bite treatment with home remedies weren’t effective in reducing itchiness and promoting the healing, you should call a doctor. In fact, mild bed bug bites are easy to cure. Though, in some cases, there are complications. The doctor will prescribe you some anti-histamine, hormonal, anti-septic and anti-bacterial medication. Drugs and creams will relieve the itch, treat allergy and cure skin infection or dermatitis. They contain diphenhydramine, cetirizine, loratadine or chlorpheniramine maleate. Follow the dosage instructions as prescribed by your doctor or directed in the label on the medication. In practice, it is required to cover bed bug welts with a thin layer of antihistamine cream. It will relieve the effects of severe allergic reaction to the bites. 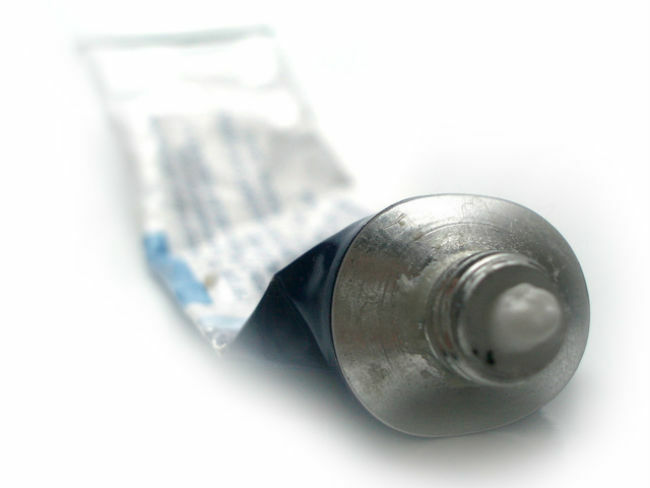 Hydrocortisone is the most common. However, apply 1% hydrocortisone cream on the itchy welts as prescribed or directed in the label. Tea tree oil, Chinese antiseptic gel and antiseptic cloroxylenol products will cure bedbug bite inflammation and skin bacterial infection due to scratching. To sum up, if you want to treat mild bed bug bites at home, use remedies that you use in your everyday life. In addition, consult your doctor in the most serious cases. How to treat bed bug bites on your kid you can read here. Moreover, try to get rid of bed bugs in your beddings and matresses immediately. No bugs – no bites!